Happy Belated Halloween and Saints Day!! Happy Thanksgiving! It has been such a long time since Chel and I have actually updated our blog . We both have been pretty busy with school and work. Which by the way if anyone is working on their master's degree in music; best of luck; you will definitely need it, because it is torture!!! Good news is that I am almost done with getting everything together and should and will receive my degree; by the end of the school year. Surprisingly! YAY! Though on the other hand I still have years to go thru when it comes to my Master's in Biology. UGH! Oh well, got to keep moving forward. I am blabbering a whole lot lately, I probably even bored my dear readers. So for US Citizens did you have the chance to vote? Or did you decide maybe not to this time? Well whatever the case. The results are in. So I am sure everyone saw the news about Obama being re- elected as US President. Congrats for him. It was really tight competition though in my opinion the Latino/Hispanic vote did make a huge difference even if the electoral votes are the ones that make the final decision, I still believe the people still influence or at least on this election. Here are a few things about the election, will be a quick a brief summary, will post the rest of the information on a page for those who acquire maybe some of the information on the 2012 election. Though I am not going to go into to much on politics because we can all just go on rampage. Either way as a American citizen I just wish the best for the US and I hope whoever is President thinks about the people and the decisions that he makes. Mr. Obama maintained his 2008 support among women. The white vote went to Mr. Romney, mostly by wide margins. But Hispanics and Asians moved toward Mr. Obama, continuing their consolidation as Democrats. Some of the president's firmest support came from low-income groups. 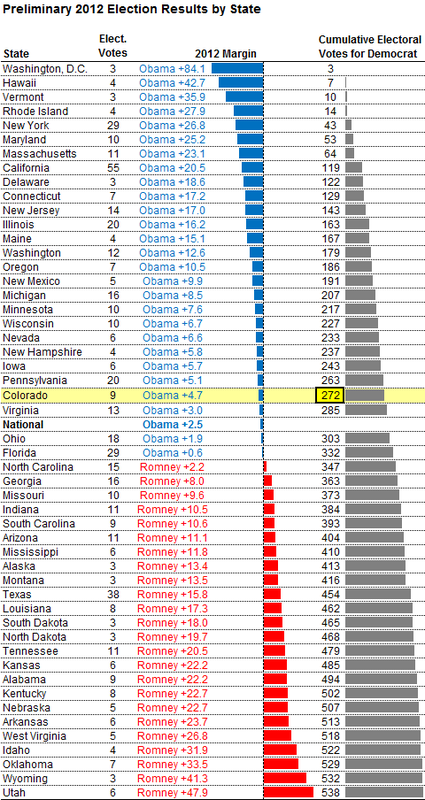 Cities shifted only slightly to Mr. Romney, and continue to be the centerpiece of the Obama majority. The suburbs broke back to the Republican side, while towns and rural areas solidified as Republican strongholds, more polarized from urban dwellers than before. Just in case you don't want to look thru all of the graphs and polls and readings on the web.